Ukulele Mele On Maui students present a show on November 10 at 1:20 p.m. at Queen Kaahumanu Center on Maui. 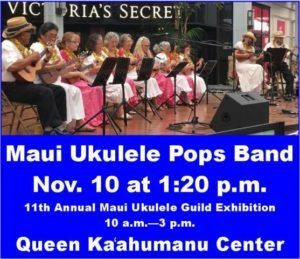 My husband and I will accompany some of my advanced ‘ukulele students performing as the Maui Ukulele Pops Band at 1:20 p.m. on Saturday, November 10 at the 11th Annual Maui Ukulele Guild Exhibition at Queen Kaahumanu Center in Kahului, Maui. These students take classes from me at Kaunoa Senior Center for adults 55 and better. We will play and sing a variety of popular songs including songs from different ethnic groups (Japanese, Filipino, Hispanic, Hawaiian) in Hawaii. The event runs from 10 a.m. to 3 p.m. and features performances from community and school ukulele groups along with displays of how the instruments are made by ukulele builders. New this year, we will not be having a display booth and will not be at the event all day. Come to our performance of fun songs with unique ukulele strums presented by no one else at 1:20 p.m. and talk story with us afterwards. See photos from past performances at Queen Kaahumanu Center.